Celebrity English: The Hottest Shopping Day of the Year! BLACK FRIDAY! The Hottest Shopping Day of the Year! BLACK FRIDAY! Paris Hilton with getting her shop on! 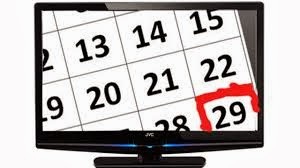 Black Friday is coming this week on Friday Nov. 29! 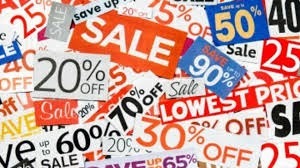 -Prices will be slashed and bargain shoppers will be lining up early at their favorite stores. And even celebrities like Paris Hilton like to shop for a deal! 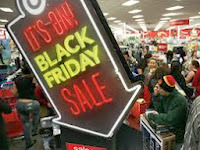 -This American shopping tradition occurs the Day After Thanksgiving (4th Thursday of November). Not an official holiday but treated like one unless you work in retail. -Generally 5am start time is pretty standard but some stores will open earlier or even be open all night from Thanksgiving Eve. Check the company's website for times. -Everywhere in America and catching on in other countries. -At your favorite shopping store and at their website. -Friends, Family, Everyone! 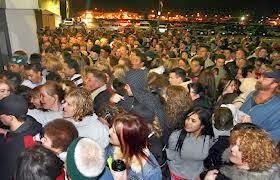 One of the busiest shopping days of the year in the United States. Expect long line-ups and chaos as people rush to get the best deals! 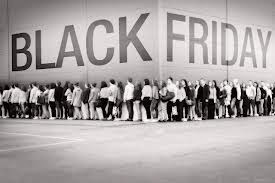 (1)Originally a slang idea/expression coming out of Philadelphia, USA: Black Friday was used to describe the idea of huge numbers of people and vehicles jammed packed on the streets the day after Thanks Giving. Everything seems black, not moving, and people’s tempers rise bringing out the worst in them. There doesn’t seem to be any light or space. The term had negative connotations. (2)Currently, Black Friday, simply invokes an idea of bargain shopping. It is considered the first day of the Christmas shopping season. Retailers also claim that this is the first day of the year that their companies make a profit or are ‘in the black’. So, for retail companies from January 1 to Nov. 22 the stores are considered ‘in the red’ or not making a profit. These two expressions stem from older accounting practices where black pen ink was used for profit and red pen ink was used to show financial losses. Thus we have the term Black Friday or the day of the year when retail stores feel they are profitable. How to get ready for Black Friday! -Check out your favorite Retail Store for Black Friday Advertisements online and in the local newspapers and flyers. Moreover, social media like Face book, Twitter, Pinterest, You Tube, etc. is filled with Black Friday fun! There are also tons of apps out there! Just select a site you trust! New to the United States? Here are some common 'Big Store Names' that everyone knows. Some Common Casual Language for talking about what you are buying or looking for on Black Friday. For the Shopper that knows what she or he wants on Black Friday. I am going to buy an Ipod. I am gonna buy a flat Screen TV. I want to get a new laptop. I wanna buy a pair of sneakers. I’m buying a new set of sunglasses. I’m looking for a bargain on watches. I’m looking for a deal on coffee makers. For the shopper with an idea of what he or she wants on Black Friday. I’m gonna look for a Christmas present for my husband. I am looking for something new in the way of winter coats. I am going to take a look at the appliances. I am going to take a look at what they have in the way of golf clubs. I might pick up an espresso machine if they have any good deals on. I think I might buy some new blouses if I see any at a good price. Didn’t find what you where looking for on Black Friday? No problem! There is also Cyber Monday! ‘Back in the day’ a lot of people weren’t very keen to shop online or use company websites. So to fix this problem and capture email addresses, the retail community invented Cyber Monday in 2005. 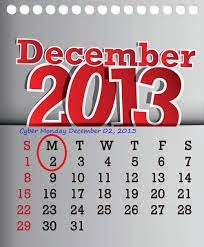 Cyber Monday occurs every year on the Monday following Thanks Giving Day. If you don’t believe me check out Amazon’s Cyber Monday Deals. Well that is all for this week! Enjoy the shopping experience of Black Friday and Cyber Monday! Oh yeah and of course Thanksgiving with Family & Friends! 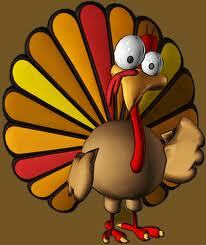 Happy Turkey Day to you my friends! Gobble Gobble!